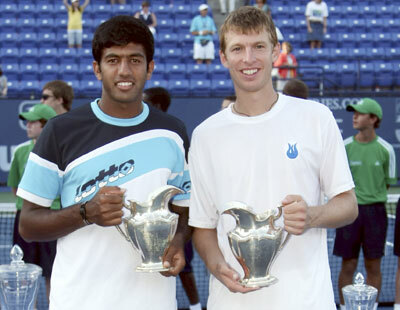 The first-time pairing of Rohan Bopanna and Eric Butorac capped a successful week by capturing their first ATP title together with a 7-6(5), 7-6(5) victory over Travis Parrott and Dusan Vemic at the Countrywide Classic in Los Angeles on Sunday. Bopanna collected his first career ATP title in his fifth finals appearance. The 27-year-old Butorac, who was appearing in his first ATP final of the year, earned his fourth career ATP title in fifth final. "It was great," said Butorac. "We've never played together before. We started out a little slow and kind of got better with each match. I think we're a pretty good team. We both serve pretty good. I'm left-handed, he's right-handed so there's different looks on the serve. It's a good situation to be in." In singles, Argentine teenager Juan Martin Del Potro upset top seed Andy Roddick [Images] 6-1, 7-6 on Sunday to win the Los Angeles Classic and claim his third successive title. In his first final on hard courts Del Potro, 19, produced a brilliant and mature performance, rocketing winners past the American for his 14th consecutive victory. Roddick, who had treatment on a lower back injury midway through the first set, was thoroughly outplayed early on and Del Potro held on in the second to complete victory without losing a set in the entire tournament.